There has been no bright perspective for the future yet here in Japan. 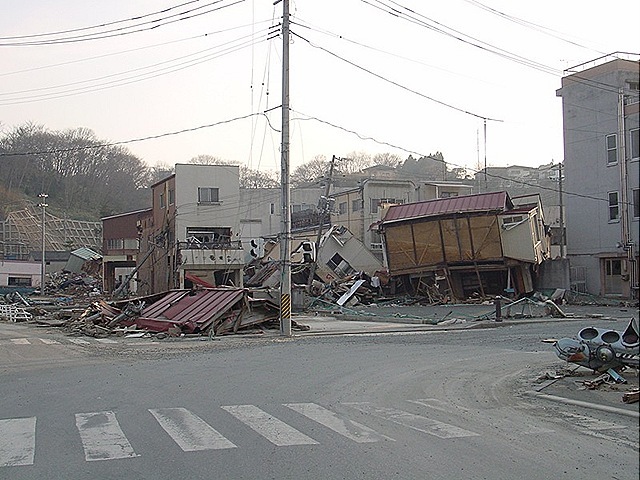 It has already passed a month and a half since the great earthquake hit the northeastern Japan on March 11. The number of the death is 14,574 and missing is 11,324 from the earthquake and the tsunami following the quake as of April 28. There are still lots of big aftershocks, tons of undisposed debris in towns, over 300,000 evacuees, and the unsettled nuclear problems in this county… But I’m going to write something positive here today. This is the article about the “survived” sake on the Chunich of 20th. I’d like to introduce it through my translation as below. 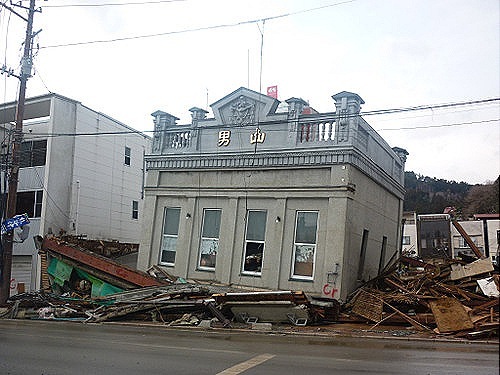 A lot of sake breweries have been visited by the disaster while brewing this time. “Otoko-Yama Honten”, the well-established sake brewery in Kesen-numa, Miyagi Prefecture, is one of them. Luckily they have been able to keep unrefined mash in their tanks and to make new sake. Kesen-numa Port, one of the biggest catch landings in Japan, has lost its beautiful scenery and has become just a huge pile of debris. There’s dust in the air and burned fishing boats still at the pier. The name board written “Otoko-Yama” in Chinese character with bright gold color stands out there. It’s an old-line sake brewery “Otoko-Yama Honten”. The building was made about 40 years ago and was a cultural property before the earthquake. It used to be a three stories high building, but now only the third floor is standing there. “According to a witness, a ship hit and destroyed this building,” said Mr. Akihiko Sugawara, 49, the president of the sake brewery. The company was established in 1912 and he is the fifth officer since then. The tsunami climbed up the mountains and came close to the brewery, but it stopped coming before a few meters from their factory. All of the employees are victims. Some of them have lost their families and houses. “I can’t make sake at times like this…” Mr. Sugawara thought and began giving up making sake this spring, but many people all over Japan encouraged him after the quake. “Orders are pouring in!” Mr. Sugawara said that with a mixed expression of crying and laughing. Tons of orders have come to this brewery, saying “I’d like to buy the “survived” sake from the tsunami” or “I’d like to buy your sake as a support,” since the company restarted at the end of last month. But they can’t send their products easily to their customers due to their lack of packages. “I had never thought such a high tsunami would come,” said Mr. Daisuke Kashiwa, 44, the sake brewer, who was working at the brewery at that time of the earthquake. He went outside after the shaking stopped, when he heard of the waves coming. He saw lots of houses being washed away with a big noise. As soon as the tidal waves went out from the parking lot, he ran away from the factory with his colleagues by car. He saw the port burning red in dark of the night through the window of the car. It was snowing hard. Burning ships blazed up when they hit the quay. “Yet, sake was safe,” said Mr. Yukihiro Takeda, 39, the worker. They had to judge the time to stop fermenting and to press the unrefined mash with the machine for making sake. They had only two options: discarding the mash or starting to brew. 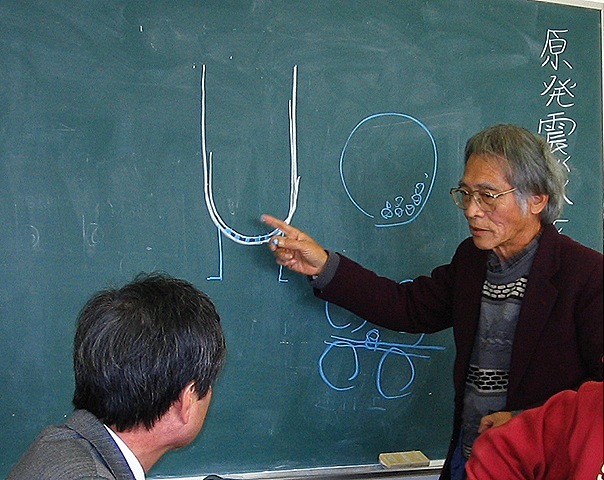 Mr. Sugawara thought, “This mash is our hope. I want to make it sake,” and Mr, Katsuhei Kamata, 68, the chief brewer, said to him, “Let’s make sake!” Mr. Kamata is veteran. He hasn’t changed his dietary habit even after the quake: eating little bit hard rice and drinking sake and hot green tea at night. According to Mr. Sugawara, Mr. Kamata never changes his life rhythm. They couldn’t use the electric power and the tap water. They used the well water for preventing too much fermentation. It was lucky for them that the temperature went down after the quake. But still they needed the power for using the machine to press the mash. Fortunately, an acquaintance lent them a large generator and some neighbors helped to bring the heavy machine into the building. “Once we decided to make sake and started it, the circle of support grew bigger and bigger.” Mr. Sugawara said that and appreciated it. “Otoko-Yama Honten” makes sake named “Fushimi-Otoko-Yama”, “Kashin” and “Sotenden” mainly. Actually, Japan’s young people don’t drink sake so much and the market of sake is flagging. “I’d like to offer nice sake going best with our local specialties: fish, oysters, and scallops.” Mr. Sugawara thought that and started creating new taste about 10 years ago. “Sotenden” is the latest one. It has become popular with its image of Kesen-numa’s blue water and sky, and young workers skills have been getting improving. And then the earthquake and the tsunami hit them. They sold their sake to Tokyo area and Sendai, but over 70% of their sales were created in local liquor shops and restaurants before the quake. But about 80% of their profitable customers have become victims, and the orders pouring in now are from all over the country and most of them are new clients. Mr. Sugawara is wondering until when they can get those orders. “I don’t know when and where severe accidents occur, but it’s inevitable, and it’s happened to be in Fukushima. 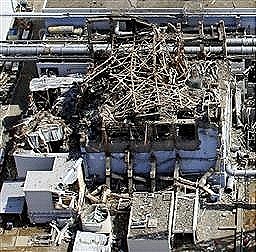 That’s all.” Mr. Kikuchi is seeing the accident of Fukushima First Nuclear Power Plant, which has been out of control by loss of power, coolly at his home in Kushima, Miyazaki Prefecture. According to him, changing plats always happened. “We couldn’t go ahead with planned action at the actual construction. We had to rewrite plats many times.” They sometimes juggled the construction with brute-force construction technique. They spent 6 billion yen for the Reactor 6. 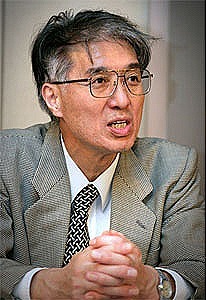 Mr. Kikuchi has engaged in the repair work on Fukushima First Nuclear Power Plant before. According to him, there were always risks of exposure to radiation at the site. What about the recriticality? Is it possible to fission again after stopping? 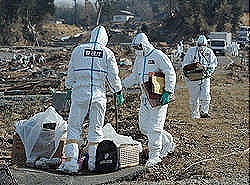 According to TEPCO, they are now researching about radioactive materials after the recriticality accident. If the recriticality occurred, its evolution heat and fission products would make the handling much more difficult. It’s not only the ocean but also the air to have been polluted. The air including radioactive materials has been leaked. 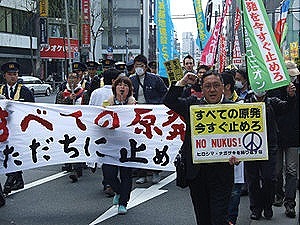 The government has told the nation, “It doesn’t have an effect on the human body immediately.” But A. Prof. H. Koide is angry saying, “They should say it doesn’t cause acute radiation damage.” Even small amount of radioactive ingredient could cause late injury such as cancers. Many of survivors of atomic bombings in Hiroshima and Nagasaki have developed leukemia within a few years and then different kinds of cancers ten years later. In Chernobyl, it has been revealed that many children have thyroid’s cancer a few years later.